When we talk about heading away on vacation, certain imagery springs to the majority of people’s minds: a week or two based on a sun lounger in an all-inclusive hotel. Now, this standard type of get away can be extremely enjoyable. It gives you the opportunity to relax, recuperate, and indulge in some great drinks and food at the same time. However, for the more active amongst us, it can sound like a nightmare. One of the things that active individuals tend to look forward to the most when they head away is the sea. If this sounds like you, here are a few things that you might want to bear in mind when planning a water based vacation! When you are aiming to take a vacation that revolves around water activities, you should seriously consider booking accommodation that lies directly alongside large expanses of water. This could vary from seafront apartments to Forest Rise Chalets & Lodge. Doing so will ensure that you waste minimal time commuting between your accommodation and the places that activities will take place, meaning you can spend more time doing what you love! If you enjoy spending time around the water, but are not a confident swimmer, or would just generally rather keep your feet on dryland, this could also prove a brilliant way to incorporate water into your trip without necessarily pushing beyond your personal boundaries. If you’re going to be in the water every day, you may want to pack a little differently to your standard traveler. Generally, people will take away one or two sets of swimwear. However, you should seriously consider taking more. This means that you don’t have to worry about washing and drying the same suits over and over. If the destination is going to be relatively hot, you should also make sure that your sun protection is waterproof. This will prevent your sunscreen from washing off, which can result in you getting burnt. Water based activities tend to be in high demand, and huge numbers of travelers make the mistake of waiting to the day before trying to book the activities that they want to take part in. This can result in disappointment, as trips and classes may already be fully booked. So, make sure to book everything up well in advance. Here are just a few ideas that you might want to consider. Snorkeling is perhaps the easiest water based activity to get involved with. All you need to do is be able to swim in shallow waters. When you book snorkelling trips, the company you have booked with will generally provide you with a snorkel, face mask, flippers, and a life jacket. All you need to do is turn up in your swimsuit, ready to go! Make sure to respect boundaries when it comes to underwater wildlife and corals. This is as much for your own safety as the animals’ or corals’. Certain animals can bite or sting, and coral can be extremely sharp. If you find that you enjoy snorkeling and want to see what exists in deeper parts of the water, you might want to consider diving. Now, diving is a little more difficult. You will have to carry a relatively heavy water tank and get to grips with more information. You should also never dive alone without supervision unless you are completely qualified and a professional yourself. Dolphins are beautiful, intelligent creatures, so it’s not all too surprising that the majority of people would be grateful for the opportunity to swim with them. However, this has resulted in tourism based companies catering to demand in all the wrong ways. Many companies now keep dolphins captive, training them to be overly social with humans, perform tricks, and consequently generate as much money as possible. This, of course, is extremely cruel. Wild creatures should not be kept in tanks. You should never give these companies your money, as paying them creates demand and means that these practices will continue to take place. However, the good news is that you can still have the opportunity to swim with dolphins in the wild. Sure, you may not be quite so up close and personal with them, but that’s the way things should be. Look for different agencies that organise boat trips out into the sea where you can see these magnificent creatures roaming free in their natural habitat! There’s something that’s inherently cool about pulling on a wetsuit, grabbing a surfboard, and taking to the waves. Unless you know how to surf already, however, you will soon learn that the pros really do make this look a lot easier than it actually is. There’s plenty of specialist knowledge and there are plenty of techniques that surfers use to be able to stand atop a wave. So, if you’re a beginner, book in a surf lesson. This will see a seasoned professional show you the tricks of the trade. Believe it or not, water based activities don’t always have to entail a whole lot of swimming. There are alternatives out there. Consider white water rafting as an example. 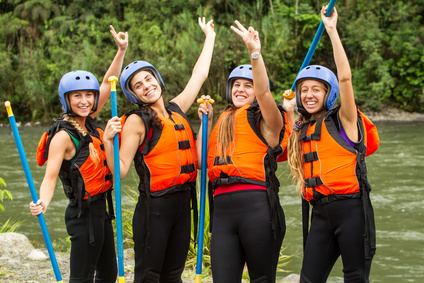 White water rafting will see you and others board a raft and head high-speed down some fast moving water. It’s a truly exhilarating experience. Just make sure that you are provided with the right safety equipment before heading out into the waters. You might also want to consider investing in a dry bag to store your personal belongings in and some water shoes, which can help you to exit the water safely. Relaxing vacations may well be tempting, but chances are that a water based getaway will provide you with a whole lot more fun! So, start planning yours today!